Why is this happening again? The answer is very simple. The police has enjoyed total impunity over its actions for years. This hasn’t changed. Few policemen were tried and convicted for torture over the past years. Central Security Forces (CSF) were never held accountable for their brutality. Additionally, most of the court cases for killing the protesters during the early days of the revolution were against police in police stations and not against the CSF units which were running around, shooting protesters with their shotguns from whatever range and in any direction they liked, shooting teargas canisters in the face and chest, and running over people with their armoured vehicles. The prosecution at that time, headed by Abdel Meguid Mahmoud, himself sacked by Morsi few days ago in his latest He-Man like powergrab, asked the CSF for evidence against itself in the ‘trial of the century' as the media called it. Abdel Meguid and Zend are now trying to head the judicial movement against Morsi's constitutional declaration. Which is not bad, in that it may put pressure on Morsi to sober up a bit. They are not, however, going to call for reform of the police or anything from the kind. Abdel Meguid doesn’t care, or rather is actually complicit in so many torture cases by closing their files before and after the revolution. IANAL but I would argue that, if we apply the international legal definition of torture, he would be sentenced to longer prison term than the perpetrators themselves. In so many incidents he knew very well that people were at risk or undergoing torture, and he didn’t intervene. He didn’t say a word during the year-long saga of trying civilians in military trials. 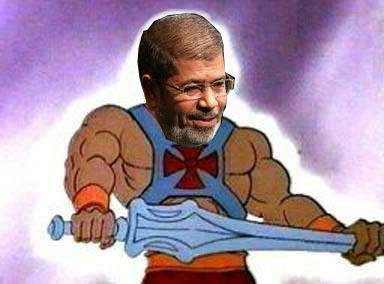 Morsi claims he is achieving the revolution goals by giving himself unlimited powers. Yet, we are seeing more people getting injured and tortured. Morsi is claiming this will help him weed out the corrupt judiciary, yet the very machine that is killing the protesters and torturing them is untouched.